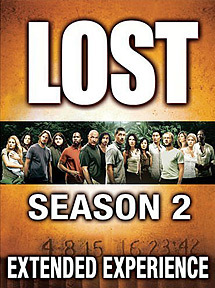 "Lost: The Complete Second Season -- The Extended Experience"
When did the launch of a DVD go from a line item in Blockbuster to a celebration worthy of red-carpet action and a sparkling soiree? When the show is ABC's Emmy Award-winning "Lost," and the seven-disc box set contains more than eight hours of bonus material, it's reason to bring a little bit of Hollywood (and a lot of media) to the islands. Buena Vista Home Entertainment and Touchstone Television celebrated the impending release of "Lost: The Complete Second Season -- The Extended Experience" at the Turtle Bay Resort on Tuesday, with cast members and executive producers in attendance. The DVDs will hit stores Sept. 5. If watching episodes sans commercials isn't exciting enough, even the most rabid fans will find something fresh and interesting in the extra footage. Listening to executive producers, directors and writers Jack Bender, Carlton Cuse, Bryan Burke and Damon Lindelof analyze the pilot episode is like eavesdropping on a discussion between professors discussing an eminent literary work, with prolific references to symbolism, character evolution and metaphors. Even so, most questions remain unanswered. For instance, we are left to figure out why Jack is so "dogmatic and empirical in his viewpoint," as one writer points out. Thankfully, we have an ample supply of flashbacks to help us out. "Lost" connoisseurs will be happy to find several unreleased flashbacks, including one of the now-deceased Shannon. Though a bit difficult to place when viewed out of context, they can add an extra layer for the knowledgeable viewer. Perhaps most interesting is the section called "Fire and Water: Anatomy of an Episode." It illuminates the detail-intensive process of an episode from concept to air date. Writers gather in a room, select a character to highlight for flashbacks, brainstorm, discuss, argue and draft story boards before pounding out dialogue. When the script is finished, location managers traverse the island selecting places that best match the story, such as a home that looks like it belongs in an English countryside on a snowy winter day. "I love how all of our flashbacks are always shot on the island of Oahu," one producer said during an off-screen discussion of an episode. "It's like, whatever we need, it's always there." Set designers then create the necessary ambience and props. This might involve building Charlie's piano that gets washed out to sea (a real one might not have gotten too far in the current). The makeup specialist talks about how he fashions a facial prosthesis so it appears that Jack is really inserting a needle in Charlie's face to stitch a cut. Editing, color correction and sound mixing are done in Los Angeles. It's amusing to watch actor Dominic Monaghan recording his near-drowning into a studio microphone -- sounds that were not picked up in the actual shots. From pre-production to studio delivery, it takes 24 days and lots of people to make a 42-minute episode. With shows airing every week, it's easy to understand why reruns come into the schedule. Some extra features are cleverly presented as a flickering, aged Dharma Initiative film issued in phases. The box set also includes deleted scenes, bloopers, insights into the hatch, commentaries from actors and writers, and a provocative promo directed by David LaChapelle that aired in the United Kingdom. "We really make the show for DVD," said writer and executive producer Carlton Cuse, who noted how much the wide-screen format and surround sound can add to the experience. His favorite part on the extras? "All of Sawyer's insults strung together. I can't believe we thought of that many!"